Seoul TouchUp was invited to host a seminar at the Impertial, after having been chosen by the Korea Gyeonggi Province Tourism Association - to represent medical tourism. Seoul TouchUp was invited to host a seminar at the Imperial hotel in Bangkok, Thailand, after having been chosen by the Korea Gyeonggi Province Tourism Association – to represent medical tourism. Recently, in 2010, South Korea’s medical tourism income had reached a total of $89.5million, a double of the amount five years prior. Consequently, the rise of the Korean Wave in the mid 2000s was said to have attributed to the explosion of foreigners travelling to Korea for plastic surgery purposes. 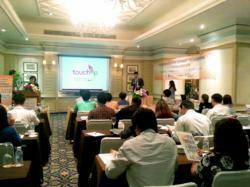 Being South Korea’s leading medical travel agency, Seoul TouchUp was chosen to present a seminar on 27th June 2013 – representing medical tourism as hosted by the Korea Gyeonggi Province Tourism Association where fifty major travel agencies in Thailand were present. Three years prior, South Korea had already established a reputation of being the ideal destination for plastic surgery purposes; with a record totalling 81,789 foreign patients. For a nation where double eyelid surgery is bestowed upon the young as a graduation gift, society has given rise to a steady belief in the consensus; a perfect physique equates to a successful life. Despite the fact that South Korea faces tough competition from neighbouring countries, people from these East Asia countries have followed suit in this trend; undergoing a supposedly harmless botox treatment to an invasive chin augmentation procedure. Nevertheless, as plastic surgery enthusiasts come from all walks of life and one of the most popular surgical procedures such as a non incision double eyelid surgery, ranges from $1,700 to $2,600 – the issue of cost for surgery may run high for many. Considering the fact that Seoul TouchUp has pioneered a first of its kind; a Korean plastic surgery forum where enthusiasts may enjoy cost-reductive benefits, the good news is here to stay for many a creative solution has been offered by the likes of Seoul TouchUp while many more are still in the works of creation. For further details on Seoul TouchUp’s Korean plastic surgery forums, please visit the website at http://www.seoultouchup.com.